Rey created this personal video, which includes himself, for his Video Techniques class. 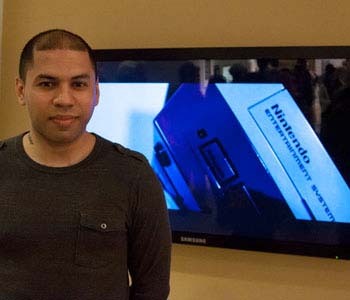 He set the story to the song “Touch” by daft Punk, and chronicled the nostalgic path of a boy delighted to receive his first Nintendo console growing into an adult preferring a more sophisticated gaming system. The Nintendo unit ends up discarded, reminiscent of the forgotten toys from the film “Toy Story.” “The song was a good platform for the story,” said Rey, a native of Brooklyn, N.Y., following a multimedia design path.